I was always curious about how does Google Home,Siri, Alexa work through readily available APIs online. In another class, I had explored the API when building a website: I used Weather online API data to find the real time temperature data online. After I did research, I found there are two APIs, Data API and Question API. This time I had an opportunity to work with question API and I had a hard time find the concept and decide what to do. Because we need to narrow down the questions we ask and visually give the answers to that questions. I am sure you know the biggest country in the world. I think you also know the top 5 biggest counties but I doubt if you know top 15 largest counties. Which country is bigger or how much bigger? When a question is asked, Wolfram Alpha’s response is displayed. People are bored of numbers and sentences. Instead of representing numbers, represent through aesthetic visuals. Instead of designing for affect-as-information, design for affect-as-interaction. I got inspiration from an existing website called, MapFight. It is a website that compares the size of any two geographical areas. 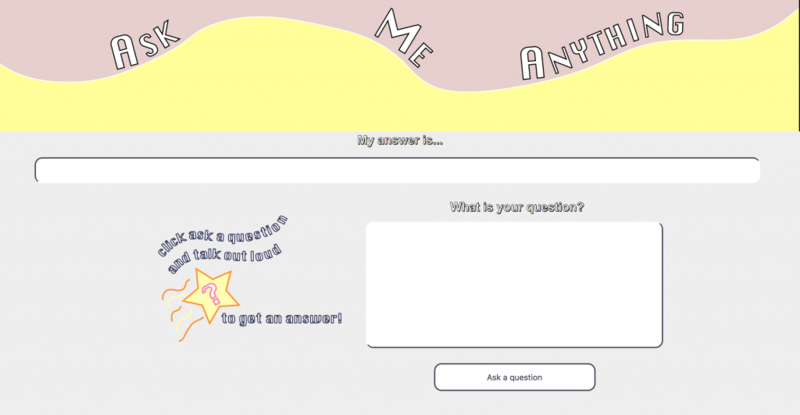 Our assignment is to explore a new way to ask questions and get the results by using specific type of data, so I change a way to ask the question. Instead of asking or typing the whole questions (What is the size of Canada? ), just type the country name. 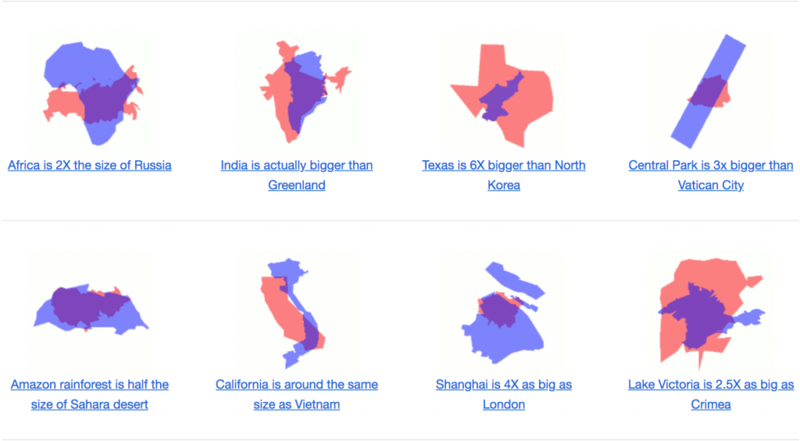 MapFight can only compare the sizes of two countries. What I attempt to do is to visually compare the sizes between countries as many as you want. Instead of giving you the answer (The total area of Canada is about 3.86 million square miles), I wanted to use different size of circle to represent the size of the country. The very first step is to have the question bar. Since I need to get the number after “about” in the answer, I split the sentence. After I got my Wolf Ram Alpha API developer key in class and set up PubNub Account for connecting the web page to the Wolf Ram Alpha API. I started working on the p5 example code. Above is my first successful attempt at accessing split Wolfram Alpha’s response on a p5 canvas. Split an array so that in every loop, those value are entered separately side by side. In order to get some visualization, I need to extract the number out of the answer(text). I found out these answers have the same format as “The total area of (country name) is about (certain number) square miles.” That is to say I need to have the number right after “about”. I used for each statement to find out “about” in an array. The forEach() method executes a provided function once for each array element. When I got my circles working, I decided to design the web page a little bit. I placed a world map on canvas and used random colour for circles. I still cannot find a way to solve the problem. What I did for the code is to extract the number after “about” and to make a circle based on that number. The thing is the answers have different units and the range of those number is too big. So if I just used the number after about, Thailand would be larger than Canada and cannot fit in canvas. I also tried to ask the question in a different way, such as”The size of Canada in million square miles” They don’t have an answer for that question. 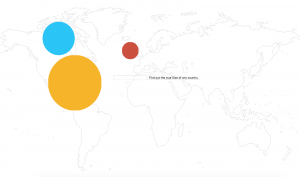 AM to PM is a visualization of local time all around the world using PubNub and the Wolpfram Spoken API to query the current local time of countries around the world. Click on a country to see the local time visualized as a lit up sky with colors indicating the time of day. To work with this response, I split the response at each ” ” and then find the position of the string ‘is’, once this string is found, I then get the next index i.e response[i+1] to get the time (7:14:48) and response[i+2] to get the string ‘A.M.’ or ‘P.M.’. The time variable is then split at each “:” where I use the hour value and “A.M.” boolean check to determine what color sky to display. Each sky color varies per hour with dark black – blue – purple skies for night time, purple – pink skies for sunrise – blue skies for mornings – yellow skies for midday – orange skies for evening and purplish – orange skies for sunsets. I wanted to map the mouse position to latitudes and longitudes but i scrapped this idea because: 1. would end up making too many api calls 2. found that giving (lat, long) values to wolfram didn’t return expected results. 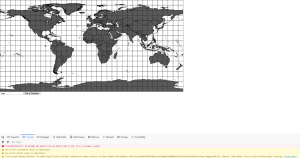 Wolfram just reinterpreted the value and can’t return a country based on a latitude and longitude. One can’t query what country is a specific latitude. I thought of using the getLocation() geolocation function to get GPS co-ordinates but went against it as this would tie me to the country linked to my IP address and I wanted my sketch to be able to change dynamically to show data on various countries. 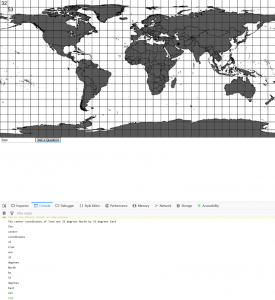 I ended up translating latitude,longitude values from Google Developer’s dataset countries.csv, using this data I translated the lat-long to x-y screen co-ordinates using the Mercator map projection function. Below is an example of how the co-ordinates translated to 2D space. After determining that the translation function was working correctly, I created a Country class, generating new countries from a .csv file and saving them in an array when the sketch was loaded. Each Country object had the following attributes : lat, long, country code, country name, x co-ordinate, and y co-ordinate. 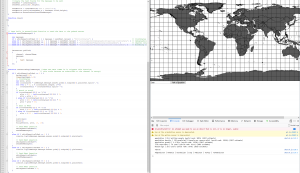 In my Country.translate() function, I put the code to translate from mercator lat,long to 2D x-y co-ordinates. In the Country.display(), I placed code to draw a circle at a specific x,y co-ordinate. Upon drawing the dots for the countries I realized that they were skewed off the map as the x,y values corresponded to a Cartesian plane. To fix this I used the map function to map the x and y values to the screen coordinates. Mapping the x-values to between 0 and screen width. 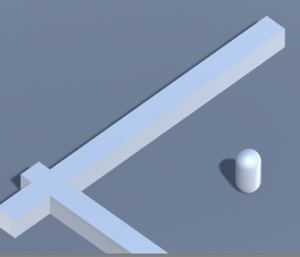 The final x,y values mapped to the screen’s width & height. The next step was to make each country dot clickable so that when a user clicked on a country dot, its country name would be passed to Pubnub to query the wolfram api. I then created a Country.clickCheck() function that is triggered on mouseClicked() to check which dot has been clicked. (see image above). This is done by checking the mousex,y location against a designated area around the x,y coordinate of the country dot. Upon finding a country that has been clicked, the country name, which is saved in a global variable that is constantly updated each time a user successfully clicks on a country, is passed to the Pubnub Wolphram Alpha query. I also updated my code so that when a country is clicked, it is highlighted by a black dot to make the visualization more meaningful. To experiment with a new way of asking a question, once I had constrained my project to local time and countries, I wanted to keep away from asking the user to type in a country. So i settled on a visualization of a map taking advantage of the affordances of a map. I wanted to keep it abstract so instead of country shapes, I created Country objects that were visually represented on a 2D map and unexpectedly, just by looking at the dots you can almost tell which continent is which. My goal was to keep it aesthetically pleasing but still informational. I am toying with the idea of printing the time values but I think the colors are pretty easy to interpret. I’d like to explore, adding more APIs to this project. With this exercise I discovered different databases and various ways to incorporate data into a visual conceptualization. Originally working with wolfram I used the incoming string of data and manipulated the type being received as answers. I was curious about other databases and came across the HYG database. It holds background information on the data of stars such as spectrum,brightness,position and distance. What is particularly interesting is HYG utilizes parsecs and gives you the distance from the earth of all the stars even ones we can’t see with the naked eyes. I thought it would be interesting to portray the visual magnitude of many of the stars we can’t see and turn it into a data visualization. 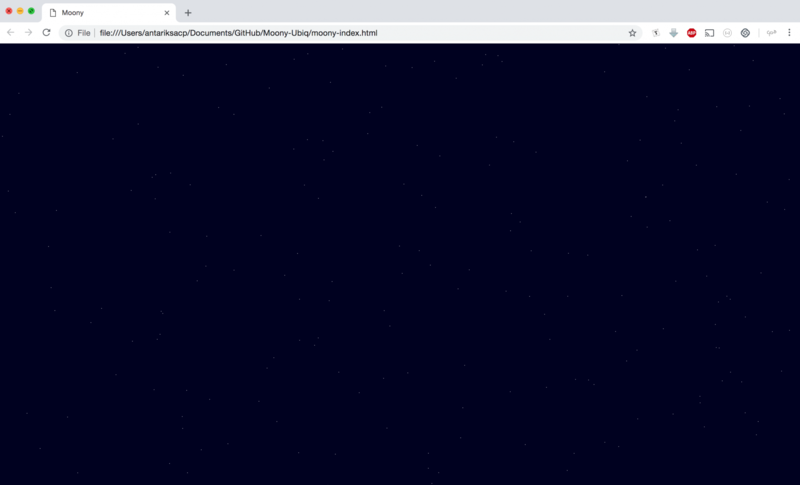 Using P5.js to receive the incoming data I mapped the catalogue of stars onto a P5.js sketch. I utilized the above code to control the incoming data. During the first stages of testing I found that the data came in very slowly at 42kb. Basically to get the data to stream in effectively I decided to just download the data once and received 121 data points to work with initially. Now that I figured out how to control the data I had to convert that information into the stars I wanted to conceptualize. I accomplished this by converting the variable line to star line.split; this inputs each entry individually in an array of entries and all the values between the commas are put in an array. When trying to figure out how to use the data I incorporated the ID at index 0 and tried to parse it into a number then saved it into the star object. I did this for id, distance and magnitude. Reading the raw data in the console it was difficult to discern which increments meant what so I went look up more documentation. For example the position of the star is actually 3 values but originally ended up coding ony 1 designation for it. At this point I wanted to see if I could distinguish the names of the stars from the abbreviations in the index. My initial idea was to attach the scientific names typed out to other characteristics listed in the index. To see if I could do this I decided to try and find the sun specifically in the data set so I had a comparison. That proposed a really good question, with all this data how do I plan to sift through it? I figured since it is a data set of all the known stars I should be able to find the sun specifically. To sift through the information I was looking for took out the read delay. This kept initiating errors ( uncaught in promise type error cannot read undefined). Next I turned to searching the documentation from the HYG Database then went to astronomy stack exchange. Other people were having the same issue with no solution in sight but to use other databases that are better for basic naming conventions. I put that aspect aside for a possible future iteration. Using a four loop initiating the star variable I used the values x,y,z. I needed the simplest way of dealing with positions and discovered the best way to do that is just to map it onto 1 plane. You can then decide which plane to coordinate to; using x.z for example, I used the x,z coordinates of the star and mapped it right into a sketch.js file. The star database seemed to have a lot of errors I was getting all kinds of zeros that I didn’t want to display. The next issue was that the data might exceed the canvas. My solution was to get a maximum number for all the values that I could find. Applying information from Lodash for all the data points that I have, I then created 1 object that tracked what the biggest and smallest numbers are. This gave me a better idea of how to map all the different stars onto the canvas. At first, while trying to discern if I have an x value of -1000 how do I display it within the range of the canvas. I then realized If the smallest value of a star is -1000 then that should map back to 0. I was able to accomplish this by initiating in the code (If stars.length already exceeds 1000 then stop). I then looked up star spectral types and then went to the HYG data base page to look up what the spectral numbers are so that I could map the spectral values of a star to RGB colours. Used this information to create a variable for spectral colours and a variable for spectral colour names. I learned a lot about more advanced debugging in this exercise. Would not have been able to make this project work without the forums where people were able to form solutions with the same issues I was experiencing. When utilizing databases they are not perfect entities and it is imperative to recalibrate. Mapping in this exercise produced varied results at first it was hard to wrap my head around having values that are meant to be 3 dimensional and how to place that data in a 2 dimensional space. Discovering Orthographic projection (sometimes orthogonal projection) is a means of representing three dimensional objects in two dimensional space. Utilizing this process is what helped me create this code effectively and was a valuable learning experience. I would like to iterate on this project at a later date and discover new ways to display this particular data set; expanding on the graphics I created and adding other elements like sound. To allow users to simply type/say the city name to get the current weather update in that city. The complete sentence also works. My starting point on this project is to research the differences between RESTful APIs and Conversational APIs. WolframAlpha is definitely a powerful conversational API, however, with no much knowledge of p5, I have no confidence to come up with the code which can send the question string automatically or display the answer in another way. Therefore my focus was moved to how to allow the “conversation features” while adding some scopes and making the user experience more smooth. Then I found Dialogflow, many may still think it is a chatbot which allows users to develop their own questions and answers then the AI feature of it can learn from these inputs. This feature still exists, however, all the answers in my app were not input by me, they are generated by the attached API, which is enabled by the “webhook” feature. The first step is to create an agent in Dialogflow, every agent would come with 2 default intents which can answer basic questions such as “Hello?”, after creating the new intent “Weather”, I typed in several common sentences used to ask weather such as “How’s the weather in Toronto?”, “Tell me about the current weather in Toronto.”, “Is it cold in Toronto?” and just the city name”Toronto”. The first three natural language sentences can satisfy users who prefer to speak the full sentence so it is more like a dialogue to them, the city name can satisfy the users who type or would like to get their answers right away. With the connection to an API, I did not have to put anything in the respond section to teach Dialogflow how to answer a question, instead, I need to find an API which is adequate to my design features. I wasted a lot of time with Yahoo weather API, which has stopped working in this January. However, once I found the OpenWeatherMap API, everything was solved. I do not have to write my own code to deploy an application, there have been some resources in GitHub. 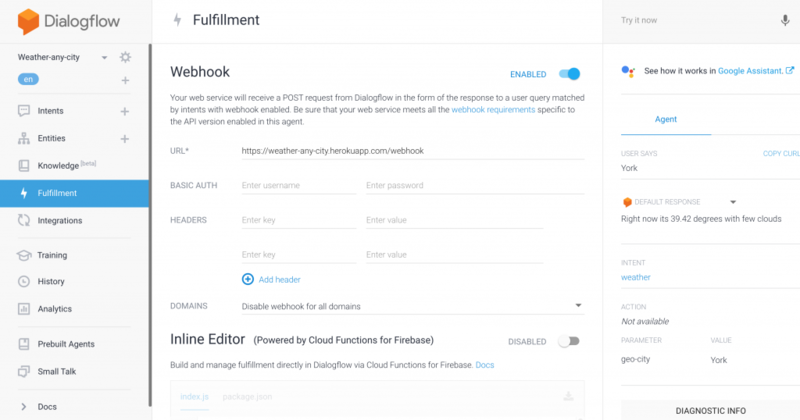 I forked the useful part of some of them and link it to my app in Heroku, where I can generate a webhook to use in the Dialogflow. After some other checkings like “enable the webhook in this intent”, this App was able to answer questions related to weathers of any city. This project is all about my exploration of accessing Wolfram APIs though p5. Starting with the Wolfram Spoken API, I wanted to be able to extract as much as information that I could. The search began around countries, I looked for their Longitude and Latitude position, to be able to trace them out. To do that, I had to extract the longitude and latitude angles from the resulting text. I found out the angles are always after the words “are” and “by”, So I look into every sentence and found those words and kept the word after them as the angle. I then converted the angles into coordinates of the canvas by looking at the geographical element. 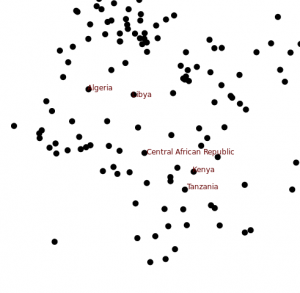 After gaining the data, I realized that I have only access to a central location for the country. Therefore I decided to stick with a simple circle indicating the countries’ positions. However, this wasn’t enough, I wanted to find a way to get more information from about the countries, so I tried asking multiple questions and showing all the results. 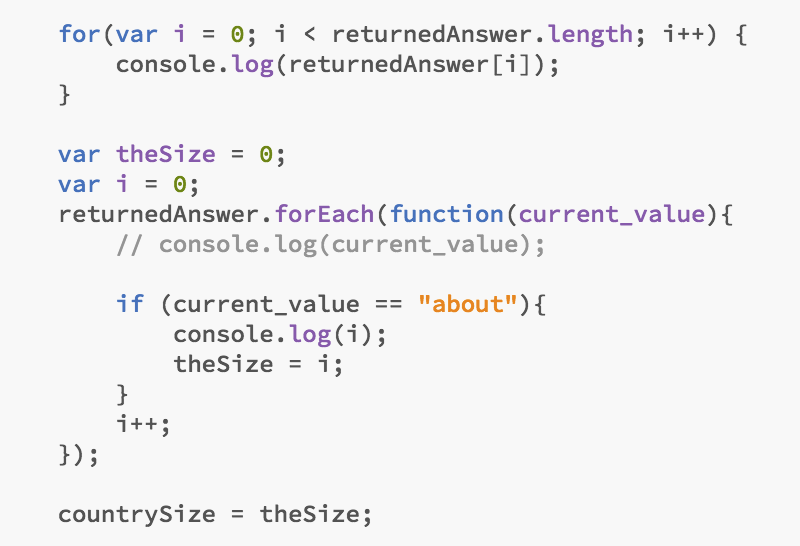 It took a very long time for the API to return each of the answers. Besides, I also wanted to gain access to more than just text. I wanted to get access to photos as well; therefore I decided to look into Wolfram’s other APIs. After looking on the Wolfram API website, I found out I could use the Full Result API. This API returns a JSON or an XML including all the information that you might need on a question or a phrase. It also returns links to images. In order to gain access to this API, I had to make some changes to the PubNub function base on the documentation. The API allows you to choose the output format that you want in addition to other filters that you can apply to your answer. After changing the API, I realized that the Full Result API contains a lot of information, much more than what I expected; therefore it requires a long time to get any information back from it. I decided to narrow down my questions by giving additional URL filters for the answer. I filtered the results base on their pod id to only receive data that I needed. I looked through all the data that the API returned given a country’s name and selected which one I wanted to show. This way I had a rapid way to access the data that I needed. I decided for my project to show a summary of information from different countries when they were look up. To begin with, I wanted to start with the flags of the countries and see if I can gain access to the URL image that I could receive from the API. I was able to retrieve the link, but when I requested for the link to be shown, it would give me a “Cross-Origin” error. After a few failed attempts at requesting the image link through PubNub and trying different things on the P5 side, I decided to ignore the image and focus back on the text data that I had access. I decided to ask different questions and show their results as they come on rather than waiting for a large amount of data to be received from the API. This made the experience much more interactive. I started by sending a request to the API with a specific pod id and wait for its response. After receiving the response, I would send another request for another search with a different pod id. I chose to request the countries’ coordinates, their demographic details, their capital city and their neighbouring countries. For the coordinates, I had to write a specific way to extract the coordinates. The API returned a string with the coordinates such as “35°N ,23°E”. I then had to convert the string into an array based on the comma, and then again break it down base on “°” to check for N, S, E and W. After that I would map the results coordinates into a position on the canvas. For the rest of the requests, I found a way that worked for all of them, giving me access to the results and then formatted them different for the display. I finally work on the visual of the application, in addition to checking the input for any mistakes, such as wrong spelling or name of things other than countries. I also added the Enter Key so that whenever it is pressed it would search the word in the API. I would like to attempt to zoom on the position of the country in the map and also gain access to other types of data such as images, videos and etc. 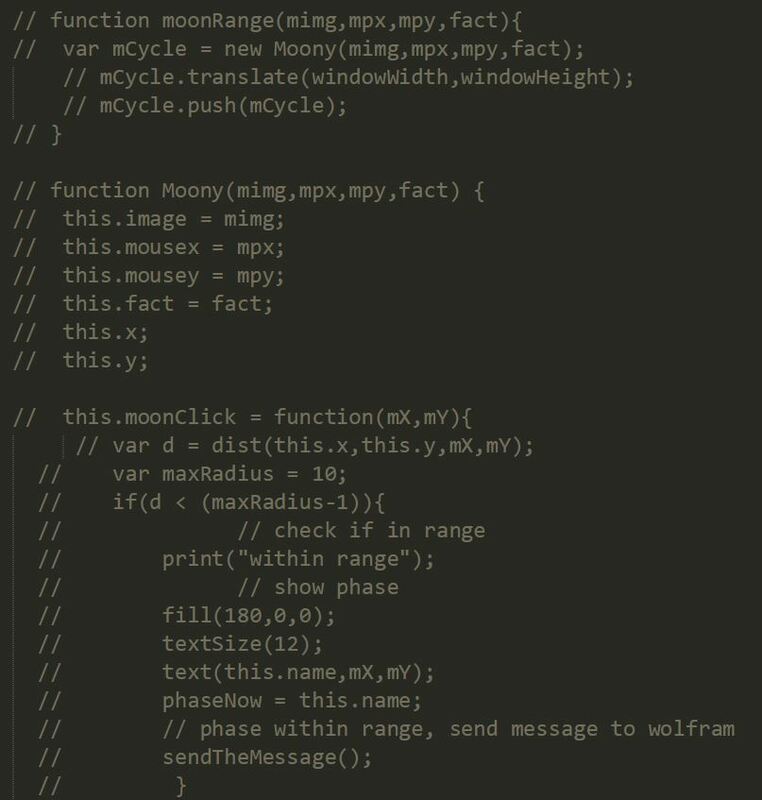 Computational APIs – Moon Phases, When? My goal for this experiment was simply to how to send a query string to an API such as Wolfram’s with a single click of the image and receive the feedback through text. I also wanted to pay attention to the overall look of the MVP page and allow some refinement on the design. 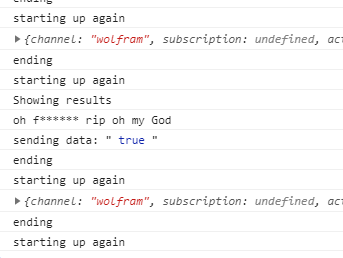 I started with using the example Nick showed in class about sending a query string to Wolfram through an input box. Since I was interested in creating a web page in the theme of the galaxy, I began by asking about the type of information that might be used. I asked questions about the different moons in the solar system and selected a few to ask as a string to Wolfram Alpha. I did not expect these answers as they were specific to telling information about size, when I wanted a random fact about the moons themselves. Once I changed from using “What” to just treating the input box like a google search bar, it finally gave me a larger variety of answers. Using “tell me about” also generated a different answer, albeit long. I realized that when working with Wolfram, you had to be clearer in what you ask for. 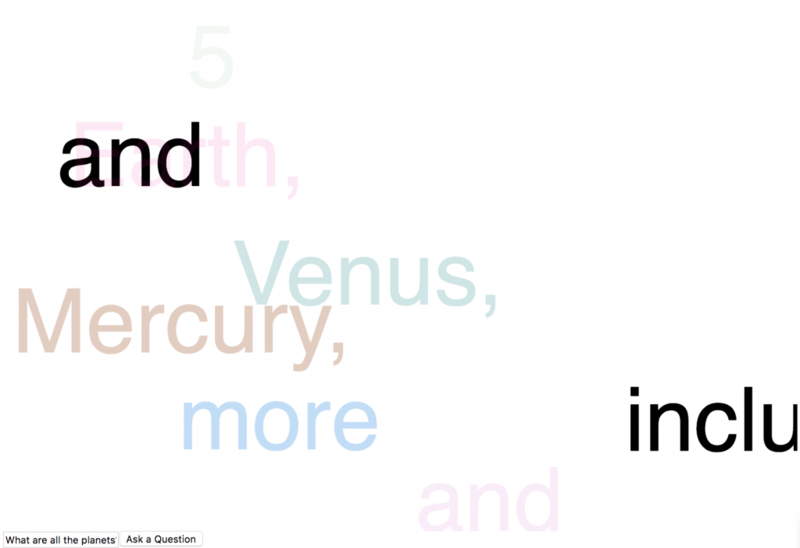 If you use words that refer to a size, Wolfram will give you the answer relating to that. I would assume that if I wanted to ask about characteristics of the moon, I would need to have known about that information to ask it. Wolfram would not give me facts that I would not know how to ask. This contradicts the purpose of the web page, as I wanted to use it to provide more facts rather than having to search them on google before hand. Perhaps I wanted one single query that can provide different answers, but that would not be possible in this case. Knowing this, I proceeded to change the focus to the earth’s moon. What I found amusing was when I sent the question with a “What” I received an answer that would be a response to “When.” It was only until I asked about the shape itself (“crescent”) that I would get information of the shape, which would serve the concept of “Moon Phase 101.” However, this would not work for the other shapes as Wolfram couldn’t understand the input to the names of the other phases. “What is a waning” “What is a Waxing” and “What is a full moon” would still give me the time in which the moon would be at that state in the month. I found this intriguing in terms of understanding the capabilities and limits of Wolfram Alpha. 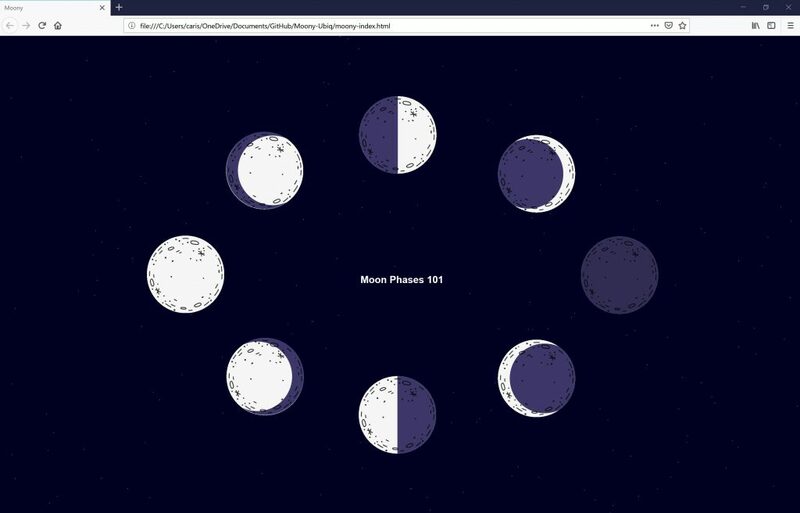 For the final page, I decided to create a page based on the answers that would imply “when” the moon will be at a certain shape, which allowed for visual association of the shape to when the phase occurs at the time of the month. The p5.js aspect to this was quite simple, as I created the illusion of space in the background through randomly scattered circles that would change each time it refreshes. 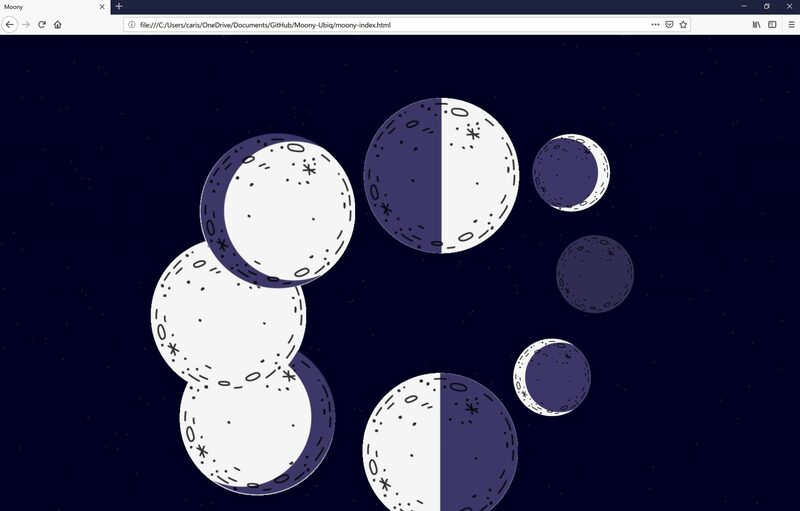 I then found a free resource online on freepik.com with the different moon phases and edited them accordingly. The final challenges to this page were preloading these images and using the mouseClicked or touchStarted function that would sendtheMessage of the question string through pubnub to Wolfram. The vector images arranged according to different x and y positions on the webpage. Used a reference from a previous p5 coordinate example to pinpoint all the locations. Since it did not work, I consulted Omid and was reminded that the easiest way to complete this simple action was just to set the range within an if function. It was nice to be reminded that sometimes the simplest things are just truly, achieved through simple means. Each of the images would call the word to the phase itself, as shown above with “new moon.” Other phases would also send information pertaining to the shape itself, such as “waning gibbous” or “waxing crescent” and in turn, giving feedback of when it will next happen in the span of a month. To further enhance the page, I would perhaps find out a way to prevent the overlapping of the response given when the images of the phases are touched. The answer is generated in the middle of the page but I would then need to find a way so that every time it is clicked, the text from the previous session disappears and is replaced with the new one. This would need experimentation with the styling of the text through readIncoming function on the basic Pubnub code and perhaps separating the strings or placing a text background if possible. I also would like to explore other types of api to enhance the page in terms of information and usage. It would be a great opportunity for me to use this theme as practice into diving deeper into css and p5.js for future web browser projects. “9.8: Random Circles with No Overlap – P5.js Tutorial.” YouTube, 15 Mar. 2016, youtu.be/XATr_jdh-44. “Hand Drawn Polka Dot Phrases.” Freepik, www.freepik.com/free-vector/hand-drawn-polka-dot-phrases_1080663.htm. “Moon Phase and Libration, 2019 Moon: NASA Science.” Moon: NASA Science, 19 Dec. 2018, moon.nasa.gov/resources/373/moon-phase-and-libration-2019/. “P5.js | Reference.” P5.js | Home, p5js.org/reference/#/p5/textStyle. “Top 10 Largest Moons In The Solar System.” THE LATEST SCIENCE SPACE HI-TECH NEWS, 29 Jan. 2018, forcetoknow.com/space/top-10-largest-moons-solar-system.html. 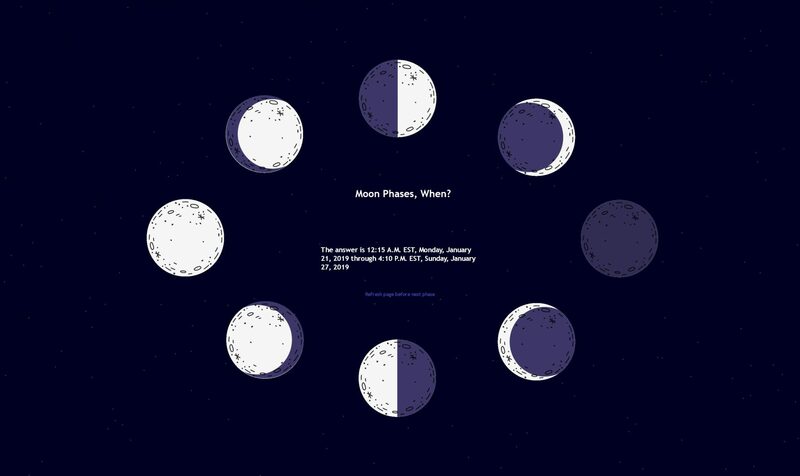 “Top 4 Keys to Understanding Moon Phases | EarthSky.org.” EarthSky – Earth, Space, Human World, Tonight, 25 Jan. 2019, earthsky.org/moon-phases/understandingmoonphases. Author Carisa AntariksaPosted on February 5, 2019 March 20, 2019 Categories Process Journal 4Leave a comment on Computational APIs – Moon Phases, When? When it comes to asking questions, the most natural to people, I think, is to say them outloud. Speech recognition is really easy to set up in p5. There’s a neat library called speech.p5 which has a verbal speech component, and a speech recognition component, letting you infer strings from speech, as well as produce speech from strings. The voice recognition part is trivial. Simply start the recording, and wait for it to identify a sentence. Once it has, save the sentence to a variable to preserve it, and then send it off to wolfram’s API. The speech is presenting more of a challenge. 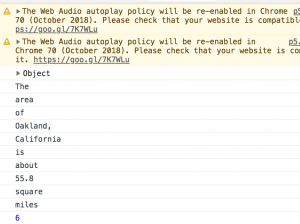 As of December 2018, Chrome has disabled speech without direct user input. Of course, this complicates things, since I want the synth to automatically speak the response it receives from the API. I have yet to solve this, without making the user press a button to confirm playback. UPDATE: changing the API type from “spoken” to “short answer” actually somehow solves this???? I have no idea why yet but IRONICALLY, SPOKEN DOESNT LIKE TO BE SPOKEN. That being said, the speech synthesizer is… mmm. Bad with time. “seven colon thirty-nine” is not a human friendly way to give the hour!! As for customizing an engine to be more specific about a field or topic,that one is an interesting case. One of the things I find especially frustrating about verbal communication with computers is that they give out the most simple answer possible, but sometimes, you want to know context. What assumptions did the machine take for granted that allowed them to pick such an answer? In some of my test cases, I would ask for the temperature, but the location didn’t match my own. Going through the API, I found that location is an input parameter you can be explicit about. For the sake of time, I simply hard coded the location to be Toronto, but in the future, it would be more useful for the user’s location to be identified by their IP address, and then passed into the server-side code in order to locate the user wherever they might be. It would be worth looking into PubNub’s geolocation API. However, this proved to be a bit of a frustrating roadblock. Though the API documentation for Wolfram Alpha suggests that simply specifying the location for the query parameter should accept a string such as ‘Toronto’, the location never seemed to change. I know it wasn’t me not managing to save the function properly because I managed to change the units from Fahrenheit to Celsius no problem. IT TURNS OUT. The conversational API varies from the base API and it doesn’t use the “location” parameter, but the “geolocation” parameter. Ok so, it’s cool, it’s chill, it works. If you ask it questions now, it will assume Toronto’s where you are and try to answer accordingly. ALSO. This text to speech recognizer has been a source of ummm… INTERESTING HUMOUR all night, as it has been picking up on, and censoring my err…. colourful exclamations of frustration. PS: another small thing I find is kind of annoying is that if you’re not careful of the language you use, the results might make the wrong assumptions. For example “what is the weather” returns a definition of the word “weather” instead of the weather, but saying “what is the temperature” returns the expected results. It doesn’t appear as though the spoken API accepts the “assumption” query parameter that the base API does. This would require a lot of query interpretation code-side, and that can get really tricky really fast. video documentation of it working.